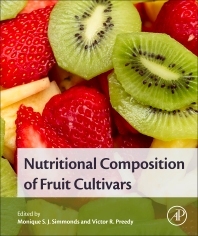 Nutritional Composition of Fruit Cultivars provides readers with the latest information on the health related properties of foods, making the documentation of the nutritive value of historical cultivars especially urgent, especially before they are lost and can't be effectively compared to modern cultivars. Because there is considerable diversity and a substantial body of the compositional studies directed towards commercial varieties, this information is useful for identifying traits and features that may be transposed from one variety to another. In addition, compositional and sensory features may also be used for commercialization and to characterize adulteration. Detailed characterization of cultivars can be used to identify "super-foods". Alternatively, unmasked historical cultivars may be the focus of reinvigorated commercial practices. Each chapter in this book has sections on the botanical aspects, the composition of traditional or ancient cultivars, the composition of modern cultivars, a focus on areas of research, the specialty of the communicating author of each chapter, and summary points. Nutritional Ingredients of Pyrus spp. Position:Director of Kew Innovation Unit, Deputy Keeper & Head of Sustainable Uses of Plants Group, Jodrell Laboratory, Royal Botanic Gardens, Kew, Richmond, Surrey, UK.